orihiro SAITO Sensei was born on 31 March 1928 in the Ibaragi prefecture of Japan. In the summer of 1946, aged 18, he started studying with the founder, and carried on until the founder's death in 1969. 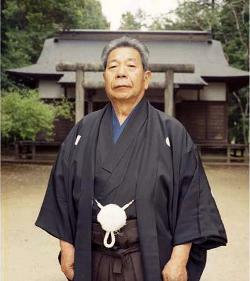 He was later awarded the grade of 9th dan (shihan). Morihiro SAITO Sensei can be considered as the spiritual son of O'Sensei ; before he died, O'Sensei chose him as custodian of the Iwama dojo. He studied under the direct authority of O'Sensei for 23 years, making him O'Sensei's most loyal and longest serving student. 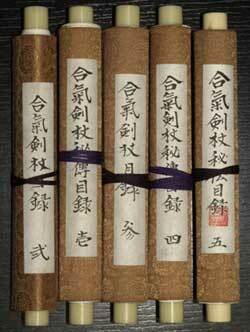 He strove to pass on this teaching unchanged during his life-time. Morihiro SAITO Sensei died on 13 May 2002 in Iwama. 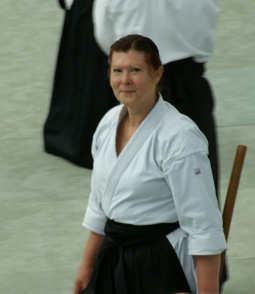 atricia GUERRI left for Japan in 1985 and studied Aikido for 3 years as an uchi-deshi (live_in student) of Morihiro SAITO Sensei in the Iwama dojo. She continued to study under his guidance for 12 years. In recognition of her work and skill, Morihiro SAITO Sensei awarded her the grade of 5th Dan, and the 5 Mokuroku, specific weapon diplomas, allowing her to teach the weapon techniques as taught by SAITO Sensei himself. Today she teaches with deducation and enthusiasm the techniques handed down by Morihiro SAITO Sensei. Her skill and mastery are living proof of the effectiveness of those techniques.